It’s about this time every year that Ye Ole debate starts, you know, the one that starts with this gem; “ugh, I HATE Halloween, it’s so American humpfff”. Yeah well, I pooh-pooh those haters and say BRING ON HALLOWEEN! Wearing costumes is fun and kids LOVE it! Dressing up in a pumpkin suit never hurt anyone right? I’m all for a fun/one-off day each year that breaks up the monotony of the daily grind – be realistic, Halloween impacts at most, 6 hours of your year – why not enjoy it? Halloween is great for meeting your neighbours! Many communities now plan amazing (and easy to organise) events that respect everyone’s decision to either be involved or abstain. 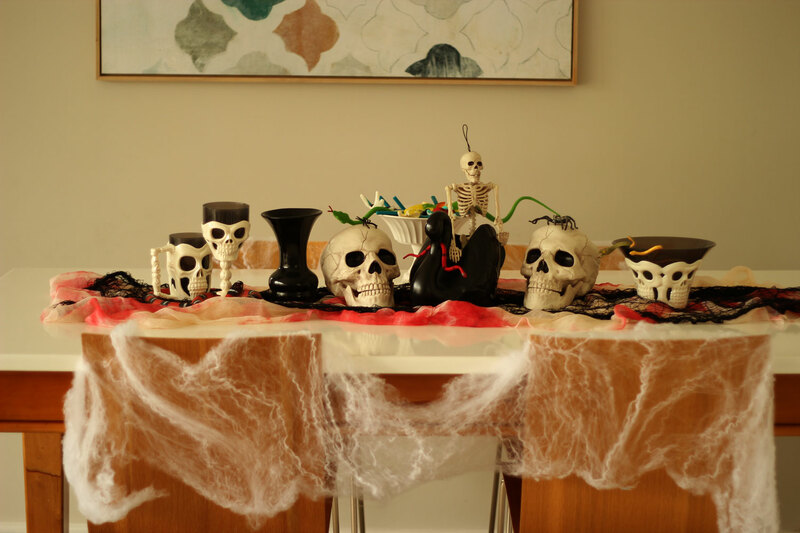 Decorating (see below) is super fun, inexpensive if you’re a savvy shopper and use what you have already, plus, Halloween is a great excuse for a party! I love decorating my mantlepiece every opportunity I get so I decided to up the anti and take #thescarehouse to a whole new level this year! Before I began I went room-to-room collecting anything that fit my ‘brief’ – basically black, black and creepy. I grabbed a print and coat hanger from Nixie’s room, some swallows off the wall (the orange paint was perfect!) some black and white pottery, a framed owl print, a calendar (turned to the 31st – All Hallows Eve :::::::whoooooo::::::) and a black clock. Random and easy. 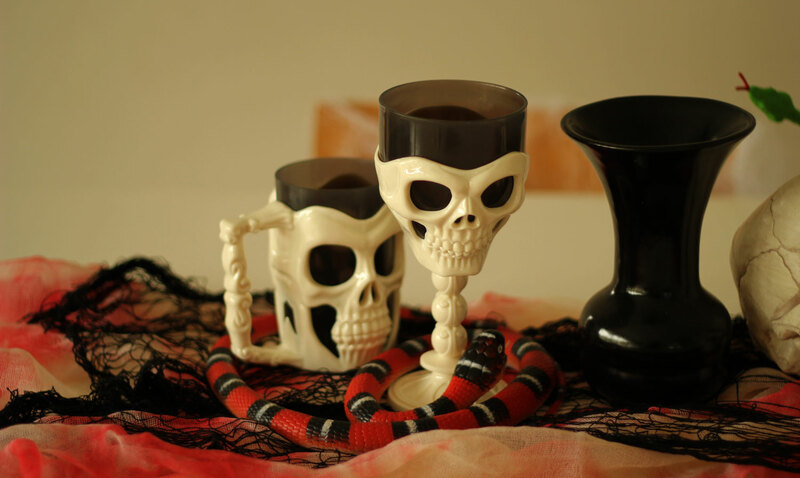 Skull Goblet Bone Colour $10, Hanging Small Skeleton $10, Skull Mug Bone Colour $10, Spooky Spiders $3, Spider Web with Spider $1, Skull with Moving Jaw $10, Skull Bone Bowl $10, Dummy Gauze Cloth $10, Rubber Spiders – Check the toy department, Rubber Snakes – Check Toy Department. 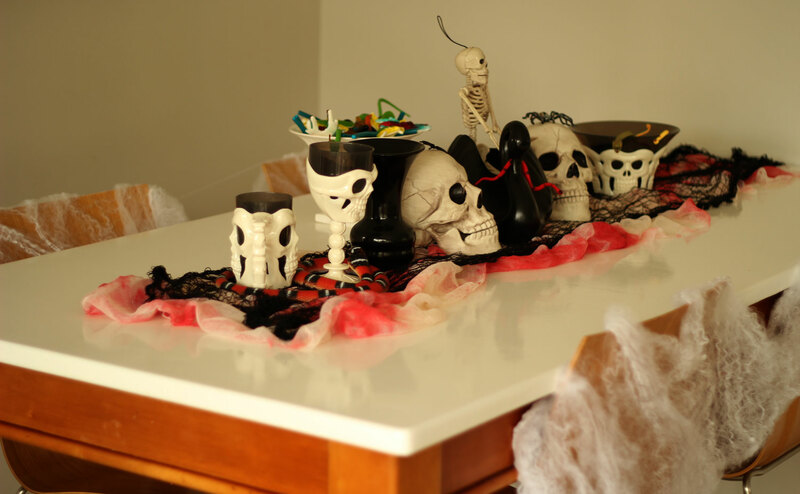 If you don’t have a mantlepiece, get creative with a themed centrepiece and get ghoulishly ready for a creepy dinner party – Halloween is on a Saturday this year! FYI, one of the $1 bags of cobwebs covered all four dining chairs! And, it wouldn’t be Halloween without costumes would it? Finding age appropriate costumes for littles is a bit tricky here in New Zealand, definitely easier if you have a little girl I think? Yes? Princesses and fairy wings and all that? Needless to say I was beyond excited to find this super-cute Pumpkin Costume for Nix also at The Warehouse, it’s comfy, not too hot and he can move easily in it – winning………….so far! We’ll see how our Neighbourhood Fright Night works out lol. 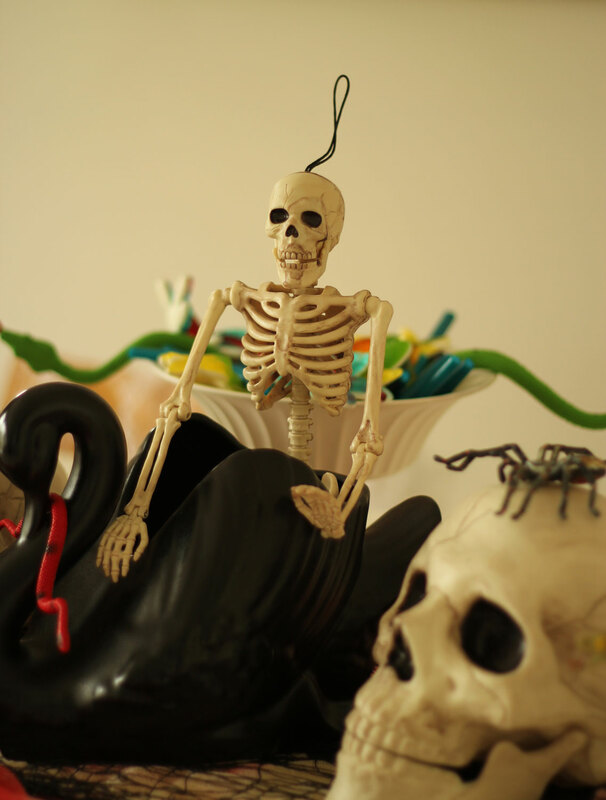 So, I’ve got my decorations, costumes and Halloween treats all sorted, early too I might add! 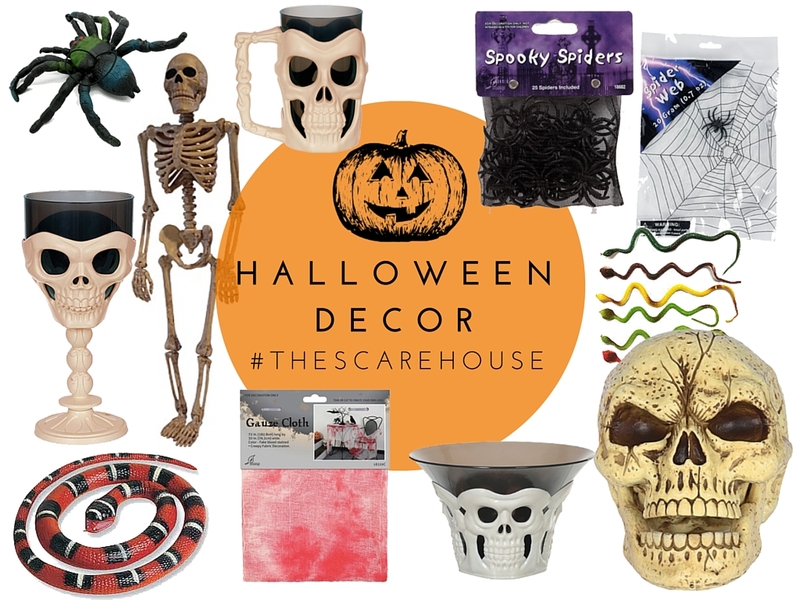 If you’re keen to get spooky with The Warehouse this Halloween, you can shop the range online or visit your local store, and I’ve got a little helping hand to make Halloween even more fun! If you would like to win a $50 gift card from The Warehouse just let me know in the comments below; Halloween: YAY or NAY? Contest closes 26/10/15 at 10pm.